Inspiration is a lively four-level course designed to take teenagers from beginner to intermediate level. Packed with activities, Inspiration strikes the perfect balance between teaching the grammar points and practising the target language in a communicative context. Inspiration is a course that ‘grows’ with its students because we understand that a 13 year old lives in a different world to a 16 year old. 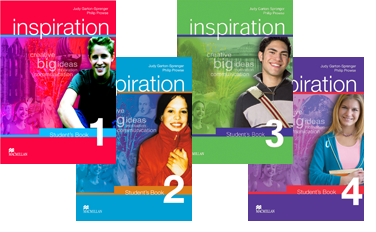 Levels 3 and 4 are written in the same recognisable Inspiration style, while taking a more adult approach to topics, with longer texts and mature subject matter that allows students to question the world they live in. New subjects such as space tourism and the underwater world of hydrothermal vents give rise to innovative communicative activities and areas for more complex grammar practice. Inspiration Extra! sections contain Revision and Extension exercises to cater for differences in ability. These pages also offer creative project work, songs, games, puzzles, tongue twisters and sketches to act out. Culture sections, which feature in every other unit, arouse students’ interest, build cross-cultural awareness and encourage discussion. Review sections at the end of every unit give regular opportunities for revision and self-assessment progress checks. A detailed grammar summary is given at the back of the Student’s Book. The topic-led syllabus integrates distinct grammatical, lexical, pronunciation, skills and learner independence focuses. Careful attention is paid to skills development in the main lessons and the Integrated Skills lesson in each unit.